Daring and brilliant ensemble in glass and metal by Walter Dorwin Teague . . . A circle of midnight blue Tufflex mirror glass rests in a satin chrome cradle . . . Beautiful stage setting for High Fidelity receiver cleverly concealed behind the chrome barred grille . . . Eleven tubes . . . High Fidelity performance . . . Five bands, American and foreign broadcast and short wave, and government weather broadcast reception . . . 150 to 400 kilocycles . . . 530 to 20,000 kilocycles . . . Silent accurate tuning or program preselection by the Viso –Glo electric eye . . . Airlane guide light . . . High Fidelity . . . Two speed tuning control . . . and 12-inch auditorium speaker . . . 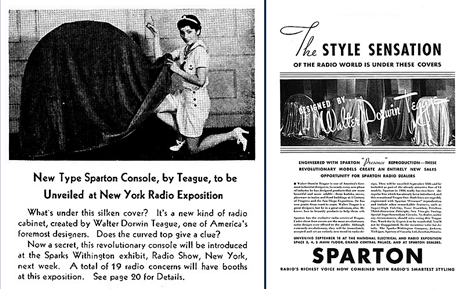 The large midnight blue Tufflex mirrored glass radio was the most daring of four designs Teague created for Sparton in 1935 for their 1936 catalogs. Embracing materials of the industrial world, Teague’s Nocturne radio elegantly transforms a utilitarian object into a work of art; it was, as Alastair Duncan writes, “The ultimate icon of modernity, one grammatically ahead of its time.” Marketed to a high-end market and intended for posh interiors, hotels, theaters or other similar venues, the deluxe Nocturne cost $350-$375 (or nearly the cost of an automobile) and was a large investment during the Depression. 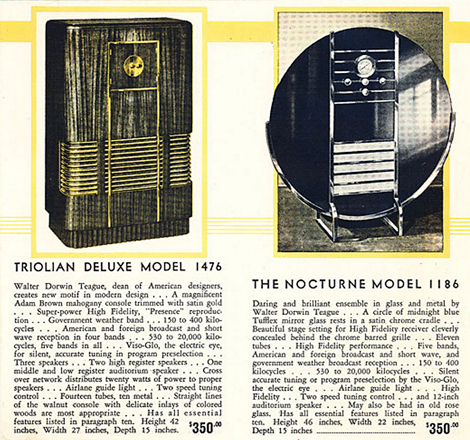 It is unknown how many examples of the Nocturne radio were produced, but as a result of the original high price and the fragility of the materials few are known to exist today. Aside from the present lot, other examples can be found in a few private collections and a handful of museum collections including the Dallas Museum of Art, the Los Angeles County Museum of Art, The Wolfsonian—FIU in Miami Beach, the Minneapolis Institute of Arts and the Philbrook Museum of Arts in Tulsa. The present lot comes from the collection of the late Roger E. Dillon, an avid radio collector who was passionate about restoring antique radios to their original ‘glory’. Dillon thoroughly researched the coveted Nocturne radio becoming an expert on the form and he was consulted for the recent award-wining documentary, Teague: Design & Beauty. This rare and magnificent example retains its original mirrors in nearly perfect condition as well as its original chrome also in very good condition. Dillon expertly restored and cleaned the radio components hidden in the cabinet behind the blue mirrored disc, and today it emits the sumptuous sounds it would have produced when it was first released in 1936. 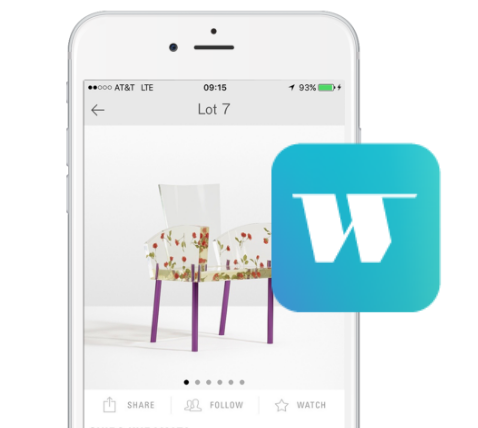 We are not building big and little gadgets—we are building an environment.